One of the multiple improvements that UWP has added to background task execution is the ability to directly invoke them from the app’s foreground window. This is extremely helpful if you are using it to update the appearance of the Live Tile using a XamlRenderingBackgroundTask – doing the same thing from the foreground isn’t trivial, the main reason being that the UIElement you want to render when calling RenderTargetBitmap.RenderAsync must be part of the current page’s visual tree (otherwise you will get an ArgumentException with the ambiguous message Value does not fall within the expected range). Before, it was solved by embedding it on the page’s XAML but with collapsed visibility – but thankfully, we don’t need to keep using this ugly hack! In this brief tutorial we are going to learn how to use this new feature to our advantage, and call our background task whenever we want to instantly update the image of the Live Tile with new content – in this case, a text message. You should already have an existing UWP app project that has a Windows Runtime Component project with the background task code – preferably one derived from XamlRenderingBackgroundTask. If not, well – you can still follow the instructions and get the source code for the entire project (linked at the end of the post). Having used background tasks previously will make it easier too! First, we need to add a Background Tasks declaration to the manifest. This will tell the runtime that we are indeed using them in the app, and will arrange the appropriate permissions for it to be executed. Open the Package.appxmanifest file and navigate to the Declarations tab. There, we are going to add a new declaration of type Background Tasks, select General from Supported task types and type the name of the class that implements the background task (including full namespace) on the Entry point field (note that you may already have this declaration if you are already using launching the task from a timer or from a system event – if so, we could even get away without selecting the General type, but do it anyway just to be sure). This is going to be a bit high level, since previous experience on background tasks is assumed. To begin with, we are going to create a custom UserControl that will hold the layout for the content of the tile – do it as you please, as we are going to use a coloured Border with a TextBlock inside for our sample. Then, instantiate it on the OnRun method of the task, and set its Width and Height – we are using 150×150, which is the size of the medium tile at 100% scale. You could detect the screen resolution and provide the scaled version accordingly – just don’t try rendering all of them, as it would use a lot of CPU and memory and the task would probably be cancelled! Make any adjustments you like to the control before being rendered – like changing the background colour, the text to be shown (which is what we are going to do) or any images it may have. Customize it as necessary to reflect the correct information in the Live Tile. Now, we are going to proceed to render the control to a bitmap and save it to a file. This is pretty standard stuff: we instantiate a RenderTargetBitmap, call RenderAsync passing our UserControl and desired final size, and open a file on the local storage for saving the bitmap. We will encode it to PNG format (so we keep transparency) using BitmapEncoder – and as a shortcut, we will create an intermediate SoftwareBitmap that will be filled with the pixels (via GetPixelsAsync) from the RenderTargetBitmap, and feed to the BitmapEncoder through SetSoftwareBitmap. Finally, we tell the BitmapEncoder to flush (via FlushAsync) the data to the file. For updating the Live Tile contents, we are going to use the excellent Notifications Extensions library – it will allow us to easily generate the XML content for the tile notification by creating statically typed objects. Finally, obtain a TileUpdater by calling TileUpdateManager.CreateTileUpdaterForApplication and call its Update method to send the notification to the tile. Going back to our UWP app project, we need to register out task to it can be called when needed. Start by adding a member variable of type ApplicationTrigger to whichever place you are going to run your background task registration from – we are going to use the app’s MainPage but you could do it from its own service, etc. Next, we need to register the task via a BackgroundTaskBuilder. Pretty standard stuff, except that we have to initialize the ApplicationTrigger member variable and pass it to the builder through SetTrigger. If the task was registered in a previous execution then we have to retrieve that registration (through BackgroundTaskRegistration.AllTasks) and obtain the reference to the trigger from there. To wrap everything up, we now can call the task whenever we want (in the sample we are using a Button.Click event for this). We just have to call the method RequestAsync from the ApplicationTrigger we instantiated/retrieved previously – and the task will run, returning a code to tell us if it was able to launch, its execution was denied or any errors happened. Try it and watch the tile change in real time! You can grab it from the UWP-Samples repository at GitHub – it’s on the BackgroundTaskFromForeground folder. As you can see, from now on all smaller UWP samples and tutorials will be added to the same repository, hopefully making it easier to browse. Last year a new UWP API surfaced: Windows.UI.Composition. It’s a framework agnostic composition library that can be used on its own, to enrich your existing XAML layouts or to entirely replace the default Storyboard implementation, among other uses. But it’s not limited to manipulating UI elements or animating them – you can even apply Direct2D effects/shaders (instantiated via the awesome Win2D library) to existing XAML elements in real time. 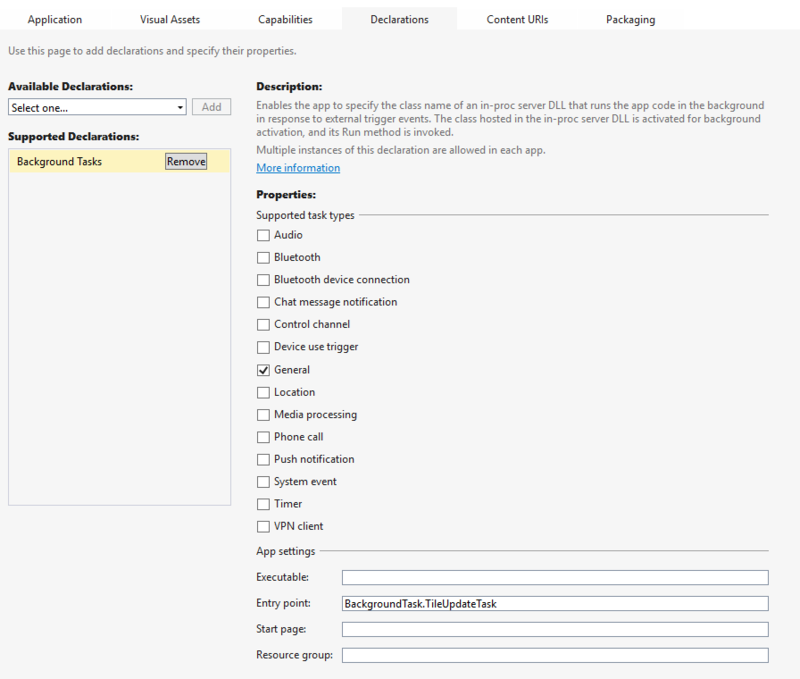 This post will be a brief explanation of a real world usage of the Windows Composition features: implementing a behavior that, when attached to a XAML control, makes it “tilt” when tapped/clicked, just like Windows Phone used for interactive UI elements. The idea is to subclass a Behavior and, when it is attached to a control (via the OnAttached override), obtain a reference to the Windows Composition Visual element of that control. Also, we will subscribe to the relevant Pointer* events to check when the user is interacting and apply or reset the tilt effect. PointerPressed: apply the tilt effect. PointerMoved: if the touch/mouse is currently pressed (PointerRoutedEventArgs.Point.IsInContact is true), apply the tilt effect; reset it otherwise. PointerReleased, PointerCanceled, PointerExited: reset the tilt effect. Finally, the tilt effect will consist on applying a rotation to the Visual element using its center as the pivot point, and with a rotation axis such that the plane of the control “looks” at the touch/mouse position. // Set a center point for rotating the Visual. // The Z value adds a bit of depth movement. // Get the contact point of the pointer, in coordinates relative to the Visual. // Obtain an offset vector from the center and normalize it. // Swap vector coordinates so they point to the correct corner and the final rotation is correct. // Rotate by a set amount of degrees. This has been done as a way of learning the basic bits of Windows Composition, and while trying to mimic the general behaviour of the old tilt effect, it doesn’t do it 100% accurately. For example, tapping on the center of the control should apply little to no rotation, and just send it to the back; also, the scaling looks a bit weird on too wide or too tall controls. And the current touch detection implementation only fires when the cursor/touch point is hitting the text of a TextBlock control – it should work on its entire bounding box. However, if it suits your needs – feel free to use it on your projects! What are you waiting for? Grab the source code on its GitHub repository. With UWP apps having mandatory .NET Native compilation before uploading to the Store, a new kind of issues have started to pop up: those caused by types and methods not processed (or stripped) by the native compilation process. While working on a pretty complex app I started experiencing this: everything worked good on Debug and Release builds that had .NET Native compilation turned off, but the moment it was switched on, the app started to experience weird crashes and exceptions raised in parts of the code that used to work without any flaws; the majority of them were related to data serialization, especially of types that relied on DataContractAttribute / DataContractSerializer. While Microsoft published a list of instructions for migrating existing codebases to .NET Native and even it has a section explaining all issues that can happen with the different types of serialization, if you skip any of the types while updating the runtime directives file, tracking down what is happening can be a bit frustrating. This tells .NET Native to include all members needed for serialization through DataContractSerializer so they can be properly accessed at runtime, fixing all issues that were present on the app. Please note that if you are using DataContractJsonSerializer, XmlSerializer or other third party serializers like the Newtonsoft JSON one, the changes to the Default.rd.xml file will be slightly different.